Added a notification when the user removes a transaction from the batch. The date ranges would sometimes cause exceptions if the date format was not standard. On the main customer page, moved the Collections filter to a new Collections tab. Added a Bankruptcy filter to the Collections tab. Fixed: Could not search documents other than the manual. Fixed: If the system adjusted an electronic payment, it was possible that it could create false payments using the reduction. Removed the distinction between admittances and guest admittance. Both are merged into a single value called passes. Unlimited - Only the membership itself is required for entry. 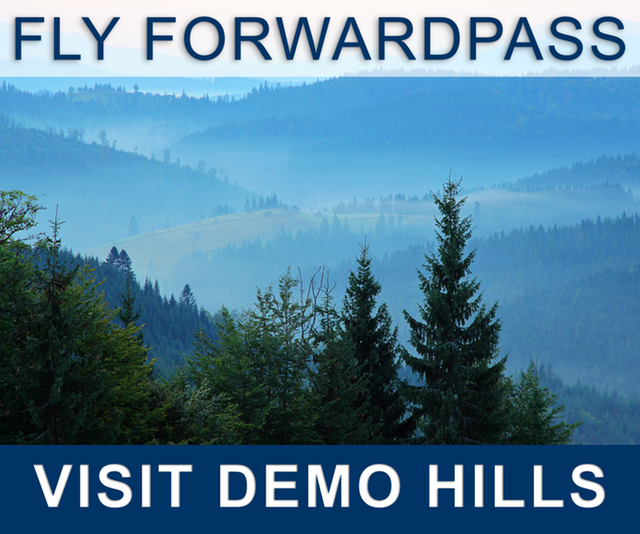 Passes are used exclusively for guests. Requires Pass - A pass is required for entry. Passes are required for both members and guests. When an item provisions membership passes in the POS and there is no membership linked to the customer, the system will automatically create a membership in the specified category and add the new passes to it. Added a Membership Counts report. The reports list the both the memberships and number of members by membership type. The date of the count can be selected on the first tab of the report page. Fixed: Check-ins by an attendant were appearing as self check-in notifications. Can now add customer and vendor notes. Clicking the Add Note button to create a new note automatically switches to the Notes tab. Fixed: New notes did not adjust in height like existing notes. If a POS is linked to a membership category, the user can check in a user directly from the POS. 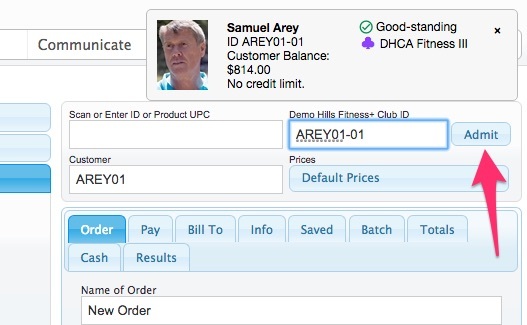 The membership ID can be scanned by a barcode scanner or entered manually (with auto-completion) into the ID field next just to the left of the Admit button. Clicking the Admit button will open the same admittance dialog used on the main membership page. 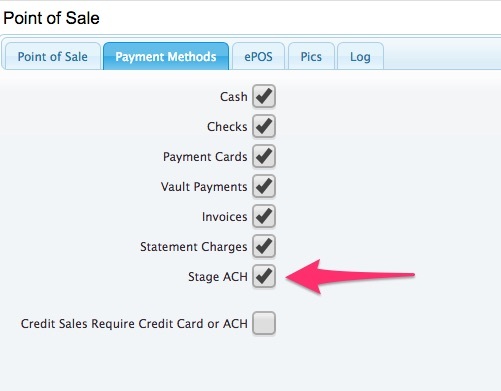 A point of sale can now stage payments for ACH payments. To enable this capability, the select the Stage ACH option in the POS. The option to stage an ACH payment will only appear as a payment option if the selected customer has ACH information in the account, the system will create an invoice and stage a pending ACH payment. Added a Collections tab to the main property page that is identical to the Collections tab on the main customer page. Neighborhood Aging - An aging report of customer balances by neighborhood as of the date of the report. It also includes the sum of the customer's credit balance as of the same date. Neighborhood Customer Balances - Sums outstanding customer balances by neighborhood as of the date of the report. Percentage of Properties in Collections - Lists the number and percentage of properties in the current search by neighborhood. Fixed: Could not make a customer statement for an individual property on the main property page. Fixed: Could not filter properties by minimum or maximum annual revenue. Fixed: Minimum and maximum revenue fields did not reformat entries into currency. Can now print out a card for individual tokens. Fixed: Could not stage payments for Invoices.